This could be a game-changer. 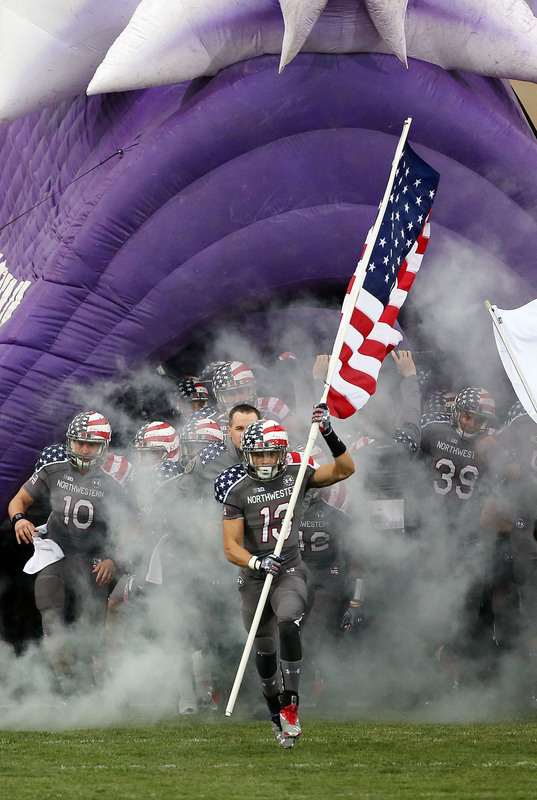 The Chicago National Labor Relations Board ruled that Northwestern's football players should be considered employees of the school and have the right to unionize. The NLRB says the athletes deserve union rights because they spend so much time committed to their sport — and because their scholarships are always hanging in the balance. Both Northwestern and the NCAA are pretty pissed off at this ruling, saying that college athletes are students first and foremost. The decision has sent shockwaves through universities across the country, and The New York Times says it "could fundamentally reshape the NCAA and alter the relationship between universities and their athletes." It could also add merit to a federal lawsuit filed last week, which accuses the NCAA of making big bucks off of college athletes without due compensation. So why do college athletes want to unionize so badly? While critics say the students are just looking for money, the athletes deny that it's all about them getting paid. Non-student-athletes may scoff at the proposition that their sports-playing peers may not get enough money to fund their education. But apparently, even the NCAA says that a full scholarship doesn't cover all expenses for its athletes. This is particularly troubling since the NCAA's deal with CBS and Turner Broadcasting rounds out to about $11.5 million per game for men's college basketball tourneys alone. And if you break your foot or suffer another injury during playing season, you can say goodbye to your scholarship and higher education. Whenever you play a sport, you are automatically putting yourself at risk of injury. That's a no-brainer. But it's become increasingly clear that school sports can cause long-term injury, particularly with concussions in football. In September, three former college football players sued the NCAA for neglecting to educate them about the dangers of concussions and not doing enough to treat brain injuries. Back in 2012, researchers found that reported concussion rates doubled after new NCAA regulations were put into place. Furthermore, the NCAA doesn't require schools to cover health-insurance costs if a student is injured while playing a sport, according to the AFL-CIO. While it will never be risk-free, those of us who want it to continue must support absolutely everything that those in power can do to make it as safe as possible. Either an actual national governing body will eliminate defining portions of the sport later on, or the sport will mercilessly police itself right now. One will happen. The latter is better for everyone. If you absolutely hate your school as a student-athlete, too bad, says the NCAA. While coaches and sporting staff can transfer jobs without penalties, college kids usually must sit out one year if they transfer schools. Only about 10 percent of student-athletes transfer schools, while about one-third of all regular students make a transfer decision. While there needs to be some regulation in college sports — we don't want the end of each school year to look like the NFL Draft — it's arguably unfair to keep someone tied down to a place they hate, because their performance will suffer. The NCAA is America’s worst workplace—at least they pay you a little something at Wal-Mart. Now, coaches are trying to exert still more control over one of the most highly controlled groups of people in existence. How’s this for a deal: We’re going to call you greedy even though you’re not getting paid, and we’re going to try our hardest to keep you from leaving. One, two, three—team! To me, it's clear that either the NCAA gives bigger voices to their student-athletes, or they need to loosen up their restrictions a bit more. Students shouldn't feel so trapped that they demand the need for unionization. I'm sure there's a lot of pressure when you're a big-name athlete bringing in loads of money for your school. But, at the same time, a student-athlete is still just a student, and there's plenty of time for negotiation if and when they sign their first professional sports contract.